In the histories of many nations, the national revolution represents a peak of achievement to which the minds of man return time and again in reverence and for a renewal of faith in freedom. For the national revolution is invariably the one period in a nation's history when the people were most united, most involved, and most decisively active in the fight for freedom. It is not to be wondered at, therefore, that almost always the leader of that revolution becomes the principal hero of his people. There is Washington for the United States, Lenin for the Soviet Union, Bolivar for Latin America, Sun Yat Sen, then Mao Tse-Tung for China and Ho Chi Minh for Vietnam. The unity between the venerated mass action and the honored single individual enhances the influence of both. "From the very beginning, when I first had notice of what was being planned, I opposed it, fought it, and demonstrated its absolute impossibility. I did even more. When later, against my advice, the movement materialized, of my own accord I offered my good offices, but my very life, and even my name, to be used in whatever way might seem best, toward stifling the rebellion; for convinced of the ills which it would bring, I considered myself fortunate if, at any sacrifice, I could prevent such useless misfortune…. I have written also (and I repeat my words) that reforms, to be beneficial, must come from above, and those which comes from below are irregularly gained and uncertain. Rizal's refusal to align himself with the revolutionary forces and his vehement condemnation of the mass movement and of its leaders have placed Filipinos in a dilemma. Either the Revolution was wrong, yet we cannot disown it, or Rizal was wrong, yet we cannot disown him either. By and large, we have chosen to ignore this apparent contradiction. Rizalists, especially, have taken the easy way out, which is to gloss over the matter. They have treated Rizal's condemnation of the Katipunan as a skeleton in his closet and have been responsible for the "silent treatment" on his unequivocal position against the Revolution. To my knowledge, there has been no extensive analysis of the question. For some Rizalists, this aspect of Rizal has been a source of embarrassment inasmuch as they picture him as the supreme symbol of our struggle for freedom. Other in fact [p. 126] privately agree with his stand as evidenced by their emphasis on the gradualism of Rizal's teachings particularly his insistence on the primacy of education. They would probably praise Rizal's stand against the Revolution, if they dared. Since they do not dare for themselves, the are also prudently silent for Rizal's sake. Others, careless and superficial in their approach to history and perhaps afraid to stir a hornet's nest of controversy, do not think it important to dwell on this contradiction between our Revolution and our national hero and elect to leave well enough alone. Perhaps they do not perceive the adverse consequences of our refusal to analyze and resolve this contradiction. Yet the consequences are manifest in our regard for our Revolution and in our understanding of Rizal. The Philippine Revolution has always been overshadowed by the omnipresent figure and the towering reputation of Rizal. Because Rizal took no part in that Revolution and in fact repudiated it, the general regard for our Revolution is not as high as it otherwise would be. On the other hand, because we refuse to analyze the significance of his repudiation, our understanding of Rizal and of his role in our national development remains superficial. This is a disservice to the event, to the man, and to ourselves. Viewed superficially, Rizal's reaction toward the Revolution is unexpected, coming as it did from a man whose life and labors were supposed to have been dedicated to the cause of his country's freedom. Had someone of lesser stature uttered those words of condemnation, he would have been considered a traitor to the cause. As a matter of fact, those words were treasonous in the light of the Filipinos' struggle against Spain. Rizal repudiated the one act which really synthesized our nationalist aspiration, and yet we consider him a nationalist leader. Such an appraisal has dangerous implications because it can be used to exculpate those who actively betrayed the Revolution and may serve to diminish the ardor of those who today may be called upon to support another great nationalist undertaking to complete the anti-colonial movement. We have magnified Rizal's role to such an extent that we have lost our sense of proportion and relegated to a subordinate position our other great men and the historic events in [p.127] which they took part. Although Rizal was already a revered figure and became more so after his martyrdom, it cannot be denied that his pre-eminence among our heroes was partly the result of American sponsorship. This sponsorship took two forms: on one hand, that of encouraging a Rizal cult, on the other, that of minimizing the importance of other heroes or even of vilifying them. There is no question that Rizal had the qualities of greatness. History cannot deny his patriotism. He was a martyr to oppression, obscurantism and bigotry. His dramatic death captured the imagination of our people. Still, we must accept the fact that his formal designation as our national hero, his elevation to his present eminence so far above all our other heroes was abetted and encouraged by the Americans. 'And now, gentlemen, you must have a national hero.' In these fateful words, addressed by then Civil Governor W. H. Taft to the Filipino members of the civil commission, Pardo de Tavera, Legarda, and Luzuriaga, lay the genesis of Rizal Day…..
Theodore Friend in his book, Between Two Empires, says that Taft "with other American colonial officials and some conservative Filipinos, chose him (Rizal) as a model hero over other contestants - Aguinaldo too militant, Bonifacio too radical, Mabini unregenerate." This decision to sponsor Rizal was implemented with the passage of the following Acts of the Philippine Commission: (1) Act No. 137 which organized the politico-military district of Morong and named it the province of Rizal "in honor of the most illustrious Filipino and the most illustrious Tagalog the islands had ever known, " (2) Act No.243 which authorized a public subscription for the erection of a monument in honor or Rizal at the Luneta, and (3) Act No. 346 [p.128] which set aside the anniversary of his death as a day of observance. Taft's appreciation for Rizal has much the same basis, as evidenced by his calling Rizal "the greatest Filipino, a physician, a novelist and a poet (who) because of his struggle for a betterment of conditions under Spanish rule was unjustly convicted and shot…. " The public image that the American desired for a Filipino national hero was quite clear. They favored a hero who would not run against the grain of American colonial policy. We must take these acts of the Americans in furtherance of a Rizal cult in the light of their initial policies which required the passage of the Sedition Law prohibiting the display of the Filipino flag. The heroes who advocated independence were therefore ignored. For to have encouraged a movement to revere Bonifacio or Mabini would not have been consistent with American colonial policy. Several factors contributed to Rizal's acceptability to the [p.129] Americans as the official hero of the Filipinos. In the first place, he was safely dead by the time the American began their aggression. No embarrassing anti-American quotations could ever be attributed to him. Moreover, Rizal's dramatic martyrdom had already made him the symbol of Spanish oppression. To focus attention on him would serve not only to concentrate Filipino hatred against the erstwhile oppressors, it would also blunt their feelings of animosity toward the new conquerors against whom there was still organized resistance at that time. His choice was a master stroke by the Americans. The honors bestowed on Rizal were naturally appreciated by the Filipinos who were proud of him. At the same time, the attention lavished on Rizal relegated other heroes to the background-heroes whose revolutionary example and anti-American pronouncements might have stiffened Filipino resistance to the new conquerors. The Americans especially emphasized the fact that Rizal was a reformer, not a separatist. He could therefore not be invoked on the question of Philippine independence. He could not be a rallying point in the resistance against the invaders. It must also be remembered that the Filipino members of the Philippine Commission were conservative ilustrados. The Americans regarded Rizal as belonging to this class. This was, therefore, one more point in his favor. Rizal belonged to the right social class -- the class that they were cultivating and building up for leadership. It may be argued that, faced with the humiliation of a second colonization, we as a people felt the need for a super-hero to bolster the national ego and we therefore allowed ourselves to be propagandized in favor of one acceptable to the colonizer. Be that as it may, certainly it is now time for us to view Rizal with more rationality and with more historicity. This need not alarm anyone but the blind worshipper. Rizal will still occupy a good position in our national pantheon even if we discard hagiolatry and subject him to a more mature historical evaluation. A proper understanding of our history is very important to us because it will serve to demonstrate how our present has been distorted by a faulty knowledge of our past. By unraveling the past we become confronted with the present already as [p.130] future. Such a re-evaluation may result in a down-grading of some heroes and even a discarding of others. It cannot spare even Rizal. The exposure of his weaknesses and limitations will also mean our liberation, for he has, to a certain extent become part of the superstructure that supports present consciousness. That is why a critical evaluation of Rizal cannot but lead to a revision of our understanding of history and of the role of the individual in history. Orthodox historians have presented history as a succession of exploits of eminent personalities, leading many of us to regard history as the product of gifted individuals. This tendency is strongly noticeable in those who have tried of late to manufacture new heroes through press releases, by the creation of foundations, or by the proclamation of centennial celebrations. Though such tactics may succeed for a limited period, they cannot insure immortality where there exists no solid basis for it. In the case of Rizal, while he was favored by colonial support and became good copy for propagandists, he had the qualifications to assume immortality. It must be admitted however, that the study of his life and works has developed into a cult distorting the role and the place of Rizal in our history. The uncritical attitude of his cultists has been greatly responsible for transforming biographers into hagiographers. His weaknesses and errors have been subtly underplayed and his virtues grossly exaggerated. In this connection, one might ask the question, what would have happened if Rizal had not been executed in December of 1896? Would the course of the Philippine Revolution have been different? This poses the question of the role of the individual in history. Was this historical phase of our libertarian struggle due to Rizal? Did the propagandists of the 19th century create the period or were they created by the period. With or without these specific individuals the social relations engendered by Spanish colonialism and the subsequent economic development of the country would have produced the nationalist movement. Without Rizal there would have developed other talents. Without Del Pilar another propagandist would have emerged. That Rizal possessed a particular talent which influenced the style of the period was accidental. That [p. 131] he was executed on December 30 only added more drama to the events of the period. If there had been no Rizal, another type of talent would have appeared who might have given a different style to the historic struggle; but the general trend engendered by the particular social relations would have remained the same. Without Rizal there may have been a delay in the maturation of our libertarian struggle, but the economic development of the period would have insured the same result. Rizal maybe accelerated it. Rizal may have given form and articulation and color to the aspirations of the people. But even without him, the nationalist struggle would have ensued. This is likewise true in the case of present-day national liberation movements. The fundamental cause of mass action is not the utterances of a leader; rather, these leaders have been impelled to action by historical forces unleashed by social development. We must therefore not fall into the error of projecting the role of the individual to the extent of denying the play of these forces as well as the creative energies of the people who are the true makers of their own history. Because Rizal had certain qualities, he was able to serve the pressing social needs of the period, needs that arose out of general and particular historical forces. He is a hero in the sense that he was able to see the problems generated by historical forces, discern the new social needs created by the historical development of new social relationships, and take an active part in meeting these needs. But he is not a hero in the sense that he could have stopped and altered the course of events. The truth of this statement is demonstrated by the fact that the Revolution broke out despite his refusal to lead it and continued despite his condemnation of it. Rizal served his people by consciously articulating the unconscious course of events. He saw more clearly than his contemporaries and felt with more intensity the problems of his country, though his viewpoint was delimited by his particular status and upbringing. He was the first Filipino but he was only a limited Filipino, the ilustrado Filipino who fought for national unity but feared the Revolution and loved his mother country, yes, but in his own ilustrado way. Though we assert that the general course of history is not directed by the desires or ideas of particular men, we must not [p. 132] fall into the error of thinking that because history can proceed independently of individuals it can proceed independently of men. The fact is that history is made by men who confront the problems of social progress and try to solve them in accordance with the historical conditions of their epoch. They set their tasks in conformity with the given conditions of their times. The closer the correspondence between a man's perception of reality and reality itself, the greater the man. The deeper his commitment to the people's cause in his own time as evidence by his life and deeds. Hence, for a deeper understanding and a more precise evaluation of Rizal as Filipino and as hero, we must examine at some length the period during which Rizal lived. As a social commentator, as the exposer of oppression, he performed a remarkable task. His writings were part of the tradition of protest which blossomed into revolution, into a separatist movement. His original aim of elevating the indio to the level of Hispanization of the peninsular so that the country could be assimilated, could become a province of Spain, was transformed into its opposite. Instead of making the Filipinos closer to Spain, the propaganda gave root to separation. The drive for Hispanization was transformed into the development of a distinct national consciousness. Rizal contributed much to the growth of this national consciousness. It was a contribution not only in terms of propaganda but in something positive that the present generation of Filipinos will owe to him and for which they will honor him by completing the task which he so nobly began. He may have had a different and limited goal at the time, a goal that for us is already passe, something we take for granted. However, for [p.135] his time this limited goal was already a big step in the right direction. This contribution was in the realm of Filipino nationhood - the winning of our name as a race, the recognition of our people as one, and the elevation of the indio into Filipino. This was a victory in the realm of consciousness, a victory in a racial sense. However, it was only a partial gain, for Rizal repudiated real de-colonization. Beguiled by the new colonizer, most Filipinos followed the example of Rizal. As a consequence, the development of the concept of national consciousness stopped short of real de-colonization and we have not yet distinguished the true Filipino from the incipient Filipino. The concept of Filipino nationhood is an important tool of analysis as well as a conceptual weapon of struggle. There are many Filipinos who do not realize they are Fiipinos only in the old cultural, racial sense. They are not aware of the term Filipino as a developing concept. Much less are they aware that today social conditions demand that the true Filipino be one who is consciously striving for de-colonization and independence. Perhaps it would be useful at this point to discuss in some detail the metamorphosis of the term Filipino not just as a matter of historical information but so that we may realize the importance of Rizal's contribution in this regard. Even more valuable are the insights we may gain into the inter-dependence between material conditions and consciousness as manifested in the evolution of the word Filipino in terms of its widening applicability and deeper significance through succeeding periods of our history. It is important to bear in mind that the term Filipino originally referred to the creoles - the Spaniards born in the Philippines - the Españoles-Filipinos or Filipinos, for short. The natives were called indios. Spanish mestizos who could pass off for white claimed to be creoles and therefore Filipinos. Towards the last quarter of the 19th century, Hispanized and urbanized indios along with Spanish mestizos and sangley [Chinese - rly] mestizos began to call themselves Filipinos, especially after the abolition of the tribute lists in the 1880s and the economic [p. 136] growth of the period. "From day to day I am becoming convinced that our countrymen, the mestizos, far from working for the common welfare, follow the policy of their predecessors, the Azcarragas. " Lopez-Jaena was referring to the Azcarraga brothers who had held important positions in the Philippines and in Spain, but who, though they had been born here, showed more sympathy for the peninsulares. 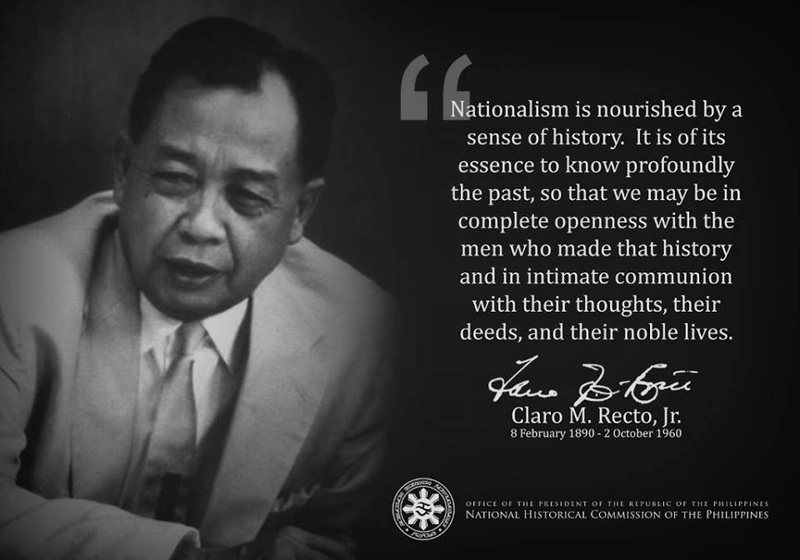 It is fortunate that a street which was once named for one of them has become Claro M. Recto today. Differences between the creoles and the "genuine" Filipinos as they called themselves, soon set in. It was at this time that Rizal and other indios in Paris began to use the term indios bravos, thus "transforming an epithet into a badge of honor." The cleavage in the Filipino colony abroad ushered in a new period of the Propaganda which may be said to have had its formal beginning with the birth of La Solidaridad. Its leaders were indios. The editor was not a creole like Lete or a Spanish mestizo like Llorente but Lopez-Jaena and later Marcelo H. del Pilar. La Solidaridad espoused the cause of liberalism and fought for democratic solutions to the problems that beset the Spanish colonies. "….under the present circumstances, we do not want separation from Spain. All that we ask is greater attention, better education, better government employees, one or two representatives and greater security for our persons and property. Spain could always win the appreciation of the Filipinos if she were only reasonable! " The indios led by Rizal gained acceptability as Filipinos because the proved their equality with the Spaniards in terms of both culture and property. This was an important stage in our appropriation of the term Filipino. Rizal's intellectual excellence paved the way for the winning of the name for the natives of the land. It was an unconscious struggle which led to a conscious recognition of the pejorative meaning of indio. Thus, the winning of the term Filipino was an anti-colonial victory for it signified the recognition of racial equality between Spaniards and Filipinos. But the appropriation of this term was not the end of the historic struggle for national identity. While for Rizal's time this was a signal victory, it was in truth a limited victory for us. For the users of the term were themselves limited Filipinos based on education and property. Since this term was applied to those who spoke in the name of the people but were not really of the people, the next stage for this growing concept should be the recognition of the masses as the real nation and their transformation into real Filipinos. However, the Filipino of today must undergo a process of de-colonization before he can become a true Filipino. The de-colonized Filipino is the real goal for our time just as the Hispanized Filipino was once the goal of the reformists. Though Rizal was able to win for his countrymen the name Filipino, it was still as ilustrado that he conceived of this term. As ilustrado he was speaking in behalf of all the indios though he was separated by culture and even by property from the masses. His ilustrado orientation manifests itself in his novels. [p. 138] Though they are supposed to represent 19th century Philippine society in microcosm, all the principal characters belonged to the principalia. His hero, Ibarra, was a Spanish mestizo. The Spaniards, the creole, the mestizo, and the wealthy Chinese - these were characters he could portray with mastery because they were within his milieu and class. But there are only very hazy description of characters who belonged to the masses. His class position, his upbringing, and his foreign education were profound influences which constituted a limitation on his understanding of his countrymen. Rizal, therefore, was an ilustrado hero whose life's mission corresponded in a general way to the wishes and aspirations of the people. He died for his people, yet his repudiation of the Revolution was an act against the people. There seems to be a contradiction between the two acts; there is actually none. Both acts were in character; Rizal was acting from patriotic motives in both instances. He condemned the Revolution because as an ilustrado he instinctively underestimated the power and the talents of the people. He believed in freedom not so much as a national right but as something to be deserved, like a medal for good behavior. Moreover, he did not equate liberty with independence. Since his idea of liberty was essentially the demand for those rights which the elite needed in order to prosper economically. Rizal did not consider political independence as a prerequisite to freedom. Fearful of the violence of people's action, he did not want us to fight for our independence. Rather, he wanted us to wait for the time when Spain, acting in her own best interests, would abandon us. He expressed himself clearly on these points in the following passage from a letter which he wrote in his cell on December 12, 1896, for the use of his defense counsel. Yet the people revered him because, though he was not with them, he died for certain principles which they believed in. He was their martyr; they recognized his labors although they knew that he was already behind them in their forward march. "…..I am one most anxious for liberties in our country and I am still desirous of them. But I placed as a prior condition the education of the people that by means of instruction and industry our country may have an individuality of its own and make itself worthy of these liberties. " This statement not only supports the American line but is also an example of how our admiration for Rizal may be used to beguile us into accepting reactionary beliefs, the products of colonial mentality. A people have every right to be free. Tutelage in the art of government as an excuse for colonialism is a discredited alibi. People learn and educate themselves in the process of struggling for freedom and liberty. They attain their highest potential only when they are masters of their own destiny. Colonialism is the only agency still trying to sell the idea that freedom is a diploma to be granted by a superior people to an inferior one after years of apprenticeship. In a way, Rizal's generation is no different from the generation that was engaged in our independence campaigns. Neither was his generation much different from those who today say they stand for independence but do not want to hurt the feelings of the Americans. In a way, Rizal and his generation were the precursors of the present-day mendicants. It may be shocking to say that Rizal was one of the practitioners of a mendicant policy, but the fact is that the propagandists, in working for certain reforms, chose Spain as the arena of their struggle instead of working among their own people, educating them and learning from them, helping them to realize their own condition and articulating their aspirations. This reflects the bifurcation between the educated and the masses. The ilustrados were the Hispanized sector of our population, hence they tried to prove that they were as Spanish as the peninsulares. They wanted to be called Filipinos in the creole sense: Filipino-Spaniards as Rizal called Ibarra. They are no different from the modern-day mendicants who try to prove that they are Americanized, meaning that they are Filipino-Americans. As a matter of fact, the ilustrados of the first propaganda movement utilized the same techniques and adopted the same general attitude as the modern-day mendicants and pseudo-nationalists, in so far as the colonizing power was concerned. The contrast to the ilustrado approach was the Katipunan of Bonifacio. Bonifacio, not as Hispanized as the ilustrados, saw in people's action the only road to liberation. The Katipunan, though of masonic and of European inspiration, was people's movement based on confidence in the people's capacity to act in its own behalf. The early rebellions, spontaneous and sporadic, could be termed movements, without consciousness. Rizal and the propagandists were the embodiment of a consciousness without a movement. It was Bonifacio and the Katipunan that embodied the unity of revolutionary consciousness and revolutionary practice. The indio as Filipino rose in arms while the ilustrado was still waiting for Spain to dispense justice and reforms. The ilustrado Filipino was now being surpassed by the indio in revolutionary ardor. The indio had a more legitimate claim to the title of Filipino because he was truly liberating himself. The revolutionary masses proclaimed their separatist goal through the Katipunan. Faced with the popular determination, the ilustrados joined the Revolution where, despite their revolutionary rhetoric, they revealed by their behavior their own limited goals. Though their fight was reformist and may be regarded as tame today, the historic role of the ilustrados cannot be denied for they were purveyors of ideas which when seized upon by the masses became real weapons. Today their ideas are orthodox and safe. However, the same concepts when made relevant to present society again make their partisans the objects of persecution by contemporary reactionaries. The role and the contribution of Rizal, like that of the ilustrado class, must be evaluated in the context of his particular reality within the general reality of his time. Rizal was a necessary moment in our evolution. But he was only a moment, and while his validity for his time amounted to a heroism that is valid for all time, we cannot say that Rizal himself will be valid for all time and that Rizal's ideas should be the yardstick for all our aspirations. He provided the model of a form of heroism that culminated in martyrdom. He was a Filipino we can be proud of, a monument to the race despite all his limitations. But we cannot make him out to be the infallible determinant of our national goals, as his blind idolators have been trying to do. We must see Rizal historically. Rizal should occupy his proper place in our pantheon of great Filipinos. Though he is secure to be in our hearts and memories as a hero, we must now realize that he has no monopoly of patriotism; he is not the zenith of our greatness; neither are all his teachings of universal and contemporary relevance and application. Just as a given social system inevitably yields to new and higher forms of social organization, so the individual hero in history gives way to new and higher forms of heroism. Each hero's contribution, however, are not nullified thereby but assume their correct place in a particular stage of the people's development. Every nation is always discovering or rediscovering heroes in the past or its present. Hero-worship, therefore, must be both historical and critical. We must always be conscious of the historical conditions and circumstances that made an individual a hero, and we must always be ready to admit at what point that hero's applicability ceases to be of current value. To allow hero-worship to be uncritical and unhistorical is to distort the meaning of the heroic individual's life, and to encourage a cult bereft of historical meaning - a cult of the individual shorn of his historical significance. It is form without content, a fad that can be used for almost anything, because it is really nothing. We must view Rizal as an evolving personality within an evolving historical period. That his martyrdom was tainted by his attacks on our independist struggle is not a ground for condemning him entirely. We must determine the factors - economic and cul- [p. 143] tural - that made Rizal what he was. We must see in his life and in his works the evolution of the Filipino and must realize that the period crowned by his death is only a moment in the totality of our history. It is a reflection of our lack of creative thinking that we continue to invoke Rizal when we discuss specific problems and present-day society. This is also a reflection of our intellectual timidity, our reluctance to espouse new causes unless we can find sanctions, however remote, in Rizal. This tendency is fraught with dangers. We are living in an age of anti-colonial revolutions different in content from those of Rizal's period. Rizal could not have anticipated the problems of today. He was not conversant with economic tools of analysis that would unravel the intricate techniques that today are being used by outside forces to consign us to a state of continued poverty. The revolutions of today would be beyond the understanding of Rizal whose Castilian orientation necessarily limited his horizon even for that period. He was capable of unraveling the myths that were woven by the oppressors of his time, but he would have been at a loss to see through the more sophisticated myths and to recognize the subtle techniques of present-day colonialists, given the state of his knowledge and experience at that time. This is not to say that were he alive today and subject to modern experiences, he would not understand the means of our times. But it is useless speculation to try to divine what he would now advocate. Unless we have an ulterior motive, there is really no need to extend Rizal's meaning so that he may have contemporary value. Many of his social criticisms are still valid today because certain aspects of our life are still carry-overs of the feudal and colonial society of his time. A true appreciation of Rizal would require that we study these social criticisms and take steps to eradicate the evils he decried. Part and parcel of the attempt to use Rizal as an authority to defend the status quo is the desire of some quarters to expunge from the Rizalist legacy the so-called controversial aspects of his writings, particularly his views on the friars and on religion. We have but to recall the resistance to the Rizal bill, [p. 144] the use of expurgated versions of the Noli Me Tangere and the El Filibusterismo, and objections to the readings of his other writings to realize that while many would have us venerate Rizal, they would want us to venerate a homogenized version. In his time, the reformist Rizal was undoubtedly a progressive force. In many areas of our life today, his ideas could still be a force for salutary change. Yet the nature of the Rizal cult is such that he is being transformed into an authority to sanction the status quo by a confluence of blind adoration and widespread ignorance of his most telling ideas. We have magnified Rizal's significance for too long. It is time to examine his limitations and profit from his weaknesses just as we have learned from the strength of his character and his virtues. His weaknesses were the weaknesses of his society. His wavering and his repudiation of mass action should be studied as a product of the society that nurtured him. - Professor Renato Constantino, Third National Rizal Lecture, December 30, 1969. 1 The full text of the manifesto may be found in Jose Rizal, Political and Historical Writings. Vol VII (Manila: National Heroes Commission, 1964), p. 348. 2 Theodore Friend, Between Two Empires (New Haven and New York: Houghton Mifflin Company, 1928), p. 15. 5 See Robert R. Reed, Hispanic Urbanism in the Philippines: A Study of the Impact of Church and State (Manila: The University of Manila, 1967), Chapter VIII. 9 Ibid., see also my essay, "The Filipino Elite," found in part two of this book. 10 Graciano Lopez-Jaena. "Letter to Rizal, March 16, 1887," Rizal's Correspondence with Fellow Reformists, Vol. II, Book II (Manila: National Heroes Commission, 1963), p. 103. 11 The Rizal-Blumentritt Correspondence, Part 1: 1886-1889, Vol. II, January 26, 1887, p. 44. 13 Rizal, The Reign of Greed, translated by Charles Derbyshire (Manila: Philippine Education Company, 1956), p. 360. 14 Rizal, "Manifesto, December 15, 1896," Political and Historical Writings, p. 348.